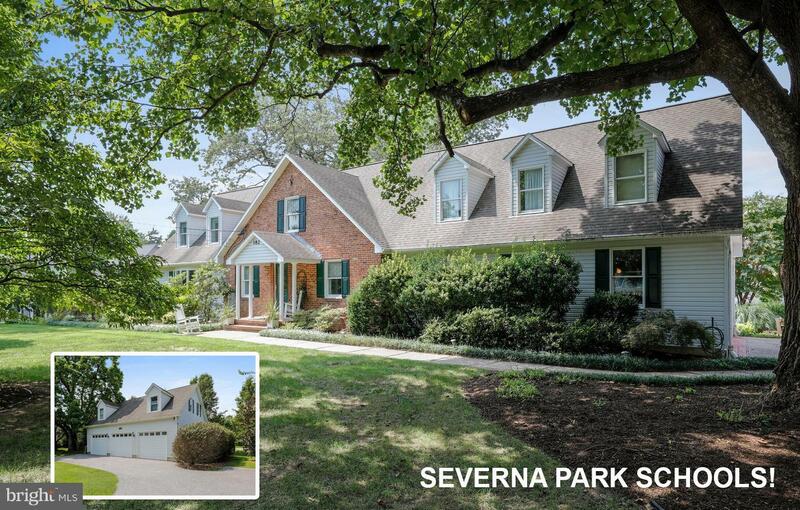 MAJOR PRICE REDUCTION - Severna Park school system! One of a kind, custom cape cod with an amazing, landscaped lot! Main house features 5 bedrooms, 4 full baths and a huge, 27 x 27 great room. Impressive master suite with custom walk-in closet and master bath. The whole main house has been recently carpeted and repainted. Oversized, detached, three car garage with 800 square foot, upper level in-law suite or apartment. Suite includes full kitchen, large living room / dining room, full bath, and spacious, light filled bedroom. Huge rear patio allows you to enjoy the beautiful, mature landscape. © 2019 Bright MLS. All rights reserved. Information Deemed Reliable, but Not Guaranteed. Listing information is from various brokers who participate in IDX and not all listings may be visible on the site. The property information being provided is for consumers personal, non-commercial use and may not be used for any purpose other than to identify prospective properties consumers may be interested in purchasing. Listing courtesy of RE/MAX Executive. Data last updated on Wednesday, April 24th, 2019 02:31:03 AM.